Fen's software activities permeated every aspect of the product development, from embedded code and comm's solution thru to UX consumer App development and engineering web interface design, and everything in between. This included specification, design and test of a complete cloud framework database structure, business rules definition and application development. It also included support for the manufacturing, test process, and post release support for features such as live OTA software updates. Careful consideration needed to be given at the initial architectural development stage, due to high level choices on distribution of processing load across the system having long term UX, feature flexibility and cost implications. Careful choices had to be made to balance the downward pressure on consumer product BOM cost with the need for feature-rich functions and performance of a high value product. Adding wireless comm's to a noisy electric motor presented a number of RF challenges. Fen had to be mindful that the core modem hardware design would become a key building block for future products on the client's roadmap. A suite of tools were developed to isolate and test each element of the system solution. - Bluetooth emulators were used to bypass the cellular infrastructure during development of the embedded lawn mover module. - A consumer unit emulator was developed and used to stress-test the cloud solution loads of up to 250,000 lawn mowers. - A system level regression test solution was created to support test driven development methodology. Fen specified, designed and installed a cellular RF verification test rig in the client's Far Eastern volume manufacturing facility. Fen specified, designed and installed a final assembly production fixture enabling parallel processing of multiple modems for final verification and registration on the cellular network. This also provided the facility to match individual product barcodes to cellular IDs on the back-end customer server. Fen worked with the client to effect significant savings in both CapEx and OpEx facets of the product. After first version product release, Fen investigated and implemented lower BOM-cost, new cellular standard devices in the embedded modem. Fen's extensive knowledge and experience in working with communications standards afforded the opportunity to design a comm's protocol so lean, the eSim provider had to review their commercial model for data charging. 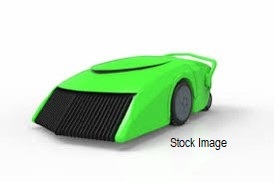 A global leader in garden power tools needed to create an internet connected robotic lawn mower. A complete end to end solution was required; from embedded product hardware & software to specification, design, test and roll-out of a complete, secure back-end service. Support was needed for choosing the most appropriate communications technologies, cloud frameworks & services, as well as qualifying third party providers suitable to partnering with a global brand’s mass market product. Data structures and API’s needed defining and implementing, to support all external interfaces such as Consumer phone App and business web service solutions, from a single code base. Fen encouraged the client to utilise cellular comm’s, rather than WiFi, in the home and garden environment as this provided a more ubiquitous and reliable solution. Use of cellular comm’s however demanded Fen create a highly efficient, but reliable, data exchange protocol, to meet business OpEx requirements. Fen developed the complete embedded hardware & software module to safely interact with the intelligent robotic motherboard, whilst serving the cloud control and reporting needs of the connected server mothership. To meet near-term corporate feasibility funding milestones, Fen took an agile approach to development, and demonstrated a complete viable product concept hosted on Fen’s servers within weeks of project start. Subsequent to product viability sign-off Fen then partnered with the client’s internal IT & data division to fully integrate the cloud solution into their back-end servers & software services. Fen worked with the client’s marketing & engineering divisions to develop first version cross-platform consumer Apps and internal web dashboard tools. As part of the specification and development process, Fen introduced and worked with third party eSim providers and hosted solution partners to deliver a fully integrated, tested and mature End-to-End IoT Solution.